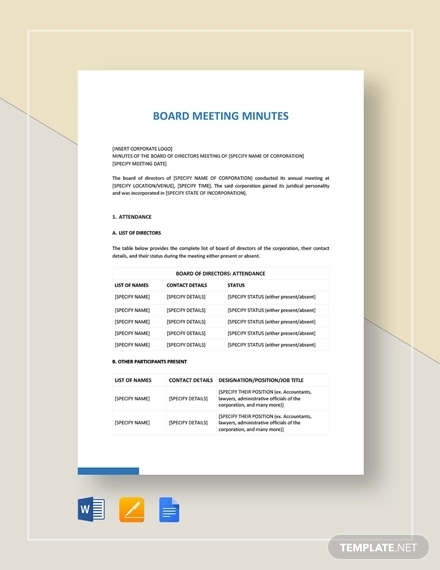 The minutes of a meeting is considered as an official and legal record of the events and decisions made in meetings or hearings. 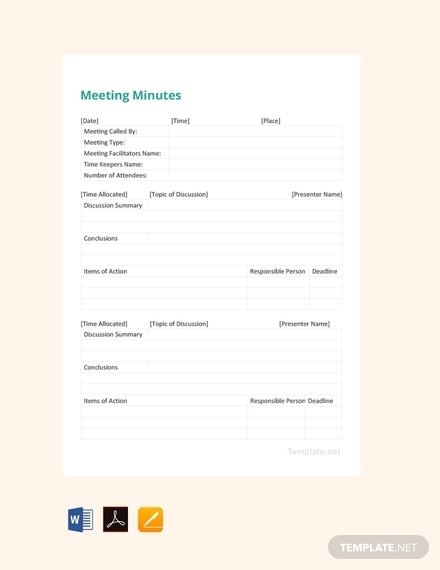 Recording the minutes of the meeting would usually describe the events that happened during a meeting as well as ensure the attendees shared a common understanding of the agenda of the meeting. Since minutes are considered as an official and legal record, writing one must not be taken lightly and must be written properly and coherently. 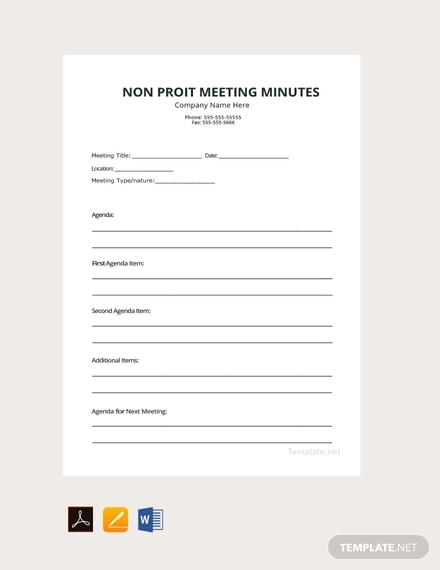 In this article, we will be discussing the basics of minutes writing, particularly on how to create one, as well as some meeting minutes templates that can help you jump-start creating one. 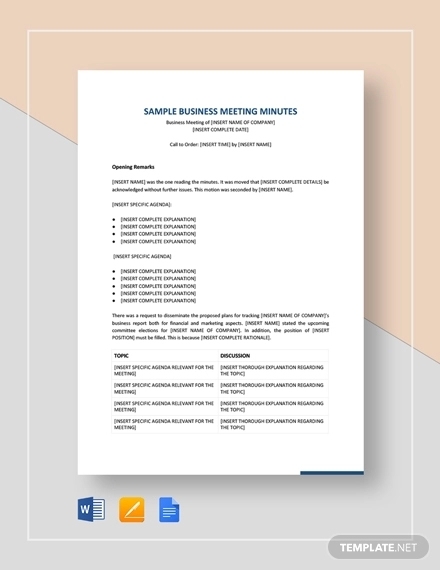 In order for the minutes to have an accurate record of what happened during a meeting, you must also have equally accurate elements included in your minutes. The elements listed below may or may not be found in your minutes as it could depend on your preference but these are generally the elements that are usually found in most meeting minutes. 1. Basic details of the company or organization: Every minute of the meeting must start with the basic details of the company or the organization who is conducting the meeting or the hearing. The usual basic details of the meeting include the name of the company or the organization, its address, and its contact details. 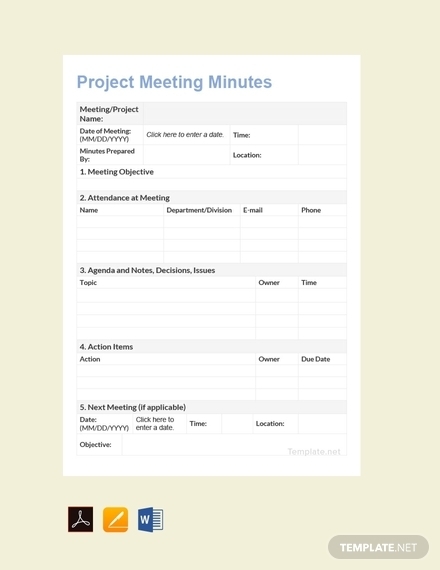 Aside from that, there should be no other information to be included so as not to make your meeting minutes looks heavy and overwhelming to the eyes. 2. Date, time, and venue of the meeting: Right after writing down the basic details regarding the company or the organization, you should then follow it with date, the duration, and the location when the meeting was held. This is a piece of crucial information for record keeping and file keeping. 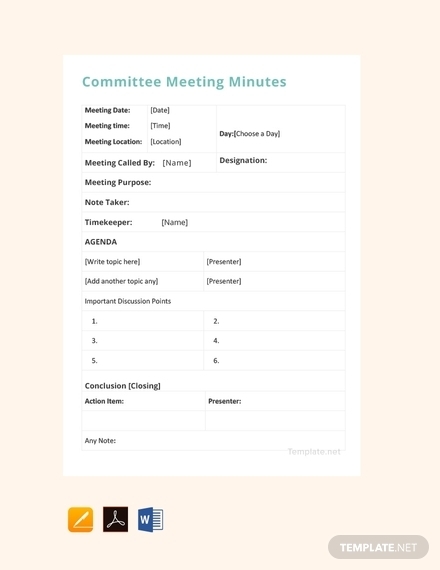 In the event that a certain meeting will be suspended or moved to a different date, this means that another meeting minutes will be created for that. The same element should also be present in the announcement for the next meeting. 3. 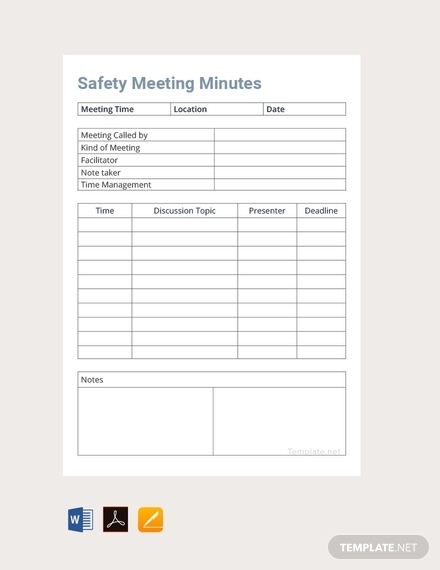 Meeting objectives: Listing down the objectives of the meeting on the minutes is also important since this is where you can refer to the topics or agenda that has been covered and resolved during the meeting. The objectives can guide you in making sure that as you write the minutes of the meeting, you are solely focusing on the topics or the agenda that should be discussed by the participant of the meeting and that you wouldn’t get sidetracked with other unrelated topics. 4. 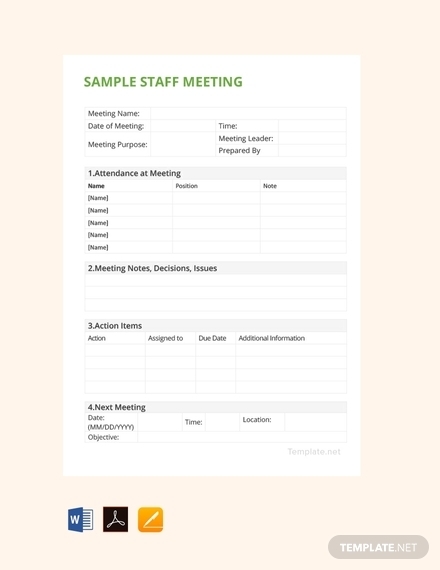 Meeting attendees or participants: Aside from the list of objectives, you must also include the list of the individuals who attended or participated during the meeting. While there is no need for you list down everyone who is attending particularly in larger meetings, there is a need for you to list down those who have high positions in the organization to know who are the ones who are accountable. Another thing you could do is to list them down according to their teams or departments. 5. Discussions from attendees: Of all the elements in this list, this is element perhaps the most important of all. 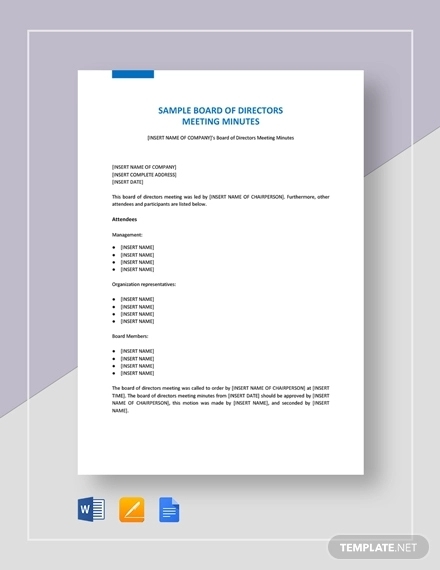 It is in the recording the discussion wherein one will know what was being covered during the meeting and this includes the meeting notes, suggestions, concerns, proposals, and updates that had been mentioned by the attendees or the participants of the meeting. However, not every word or sentence should be mentioned because the minutes of the minute is not equal to a transcript of a meeting. Just stick to what the gist of the discussion is and from there you can take down the notes. 6. Action plans: Every single meeting minutes you can find will always end with an action plan. 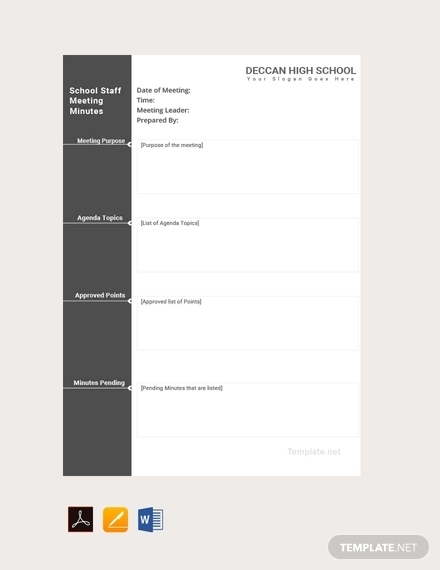 The action plan written on the minutes are the action plans discussed by the attendees or the participants of the meeting. The one who created the action plan must be the one who will list down the details of the action plan. If there is no action plan made within the other attendees, then you, who is the one who writing the minutes, must be the one who should write down his or her own action according to the proposal. 7. Announcements: It is not unusual that a meeting will get adjourned despite not having discussed everything in the agenda. During cases such as time constraints and lack or absence of resources, it is important that a proposed agenda for the next meeting will be indicated in the minutes together with the other announcement made by the other attendees or participants of the meeting. 8. 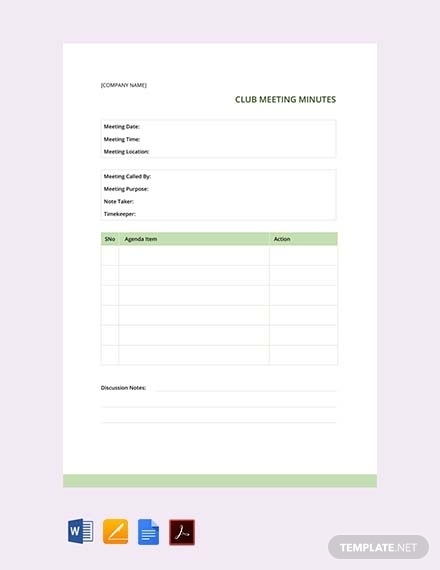 Next meeting: If there are some unfinished businesses or matters that need to be discussed more, the next scheduled meeting must be indicated in your meeting minutes. You also have to announce the information regarding this to the attendees or the participants of the meeting for them to be informed in advance so they can easily clear out their schedules and some other matters they initially scheduled. 9. 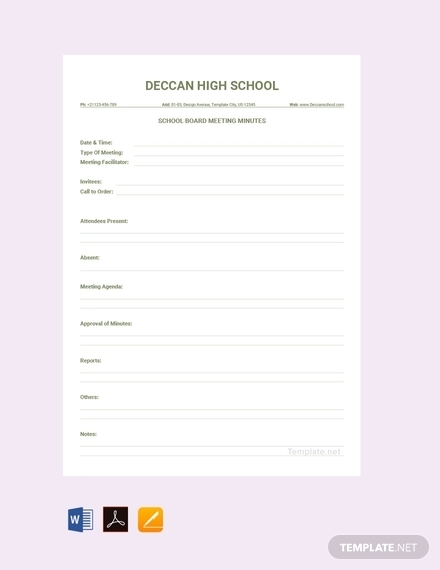 Signature line: This is usually the last part of the meeting minutes where you should be writing down your full name in print as well as the signature to signify that you were the one who prepared the meeting minutes. The date as to when it was submitted and received must also be indicated. In some circumstances, there are more than one signatory. 1. 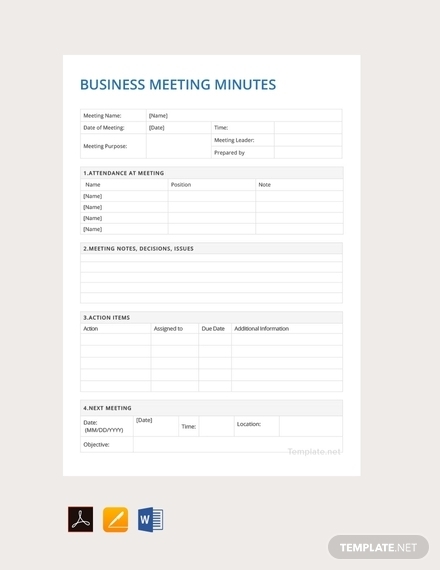 Create or decide on your preferred layout: Before you should be writing the actual meeting minutes, you still need to create your preferred meeting minutes layout so you can already have the proper placement for each of the different elements of your minutes. You can plan out the layout in a sheet of paper or in a graphic design software. 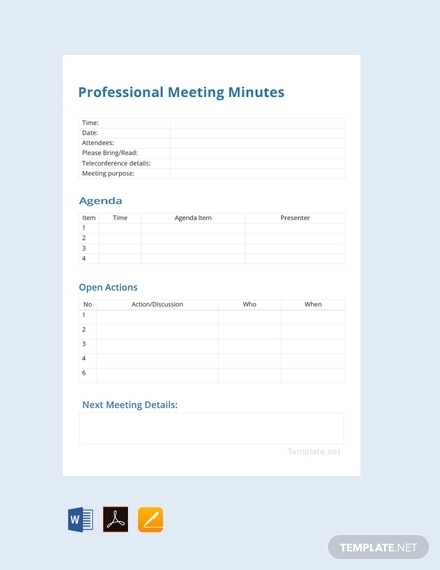 You can also make use of a meeting minutes template wherein you can already find ready-made layout designs for the kind of meeting minutes design that you want. 2. Incorporate all the elements into the layout: Once you have already determined your preferred layout, you may now incorporate all of the basic elements that your minutes must have. 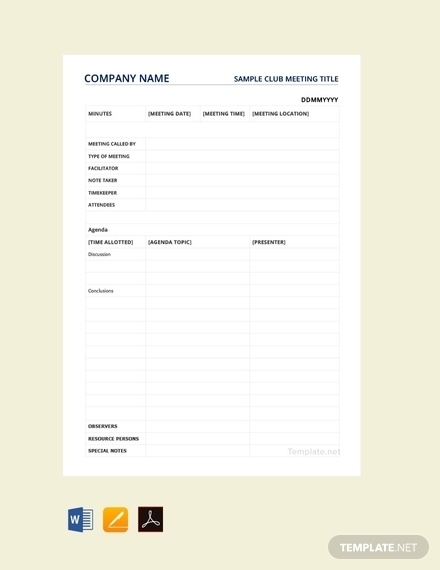 These elements includes the basic details of the company or organization, the date, time and location of the meeting, the objectives or agenda to be discussed, the meeting attendees or participants, discussions, action plans, announcements, plans for another meeting, and finally a space where you can write your signature. 3. 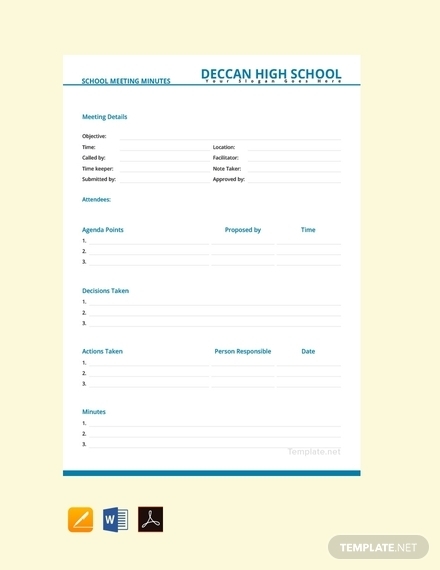 Check thoroughly and edit carefully: After incorporating all of the necessary basic elements, you should now proceed to checking everything that you have written on your minutes. Do not underestimate this crucial step since this is where you should notice every single error and mistake that you have made from what you have initially written. And as soon as you have noticed every single grammatical mistakes and spelling errors you have made, edit it immediately and carefully so you can have it ready for printing already. 4. 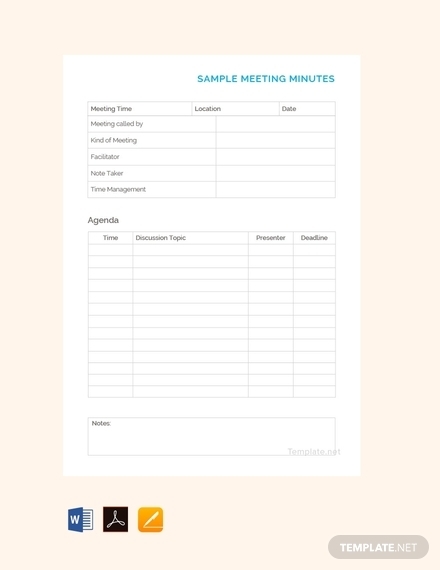 Print it: If everything on your meeting minutes is already set in place and has no more need for further checking, you can already have it printed. Make sure you choose the correct paper size. The usual paper size used for business documents are the US Letter size and the A4 size. 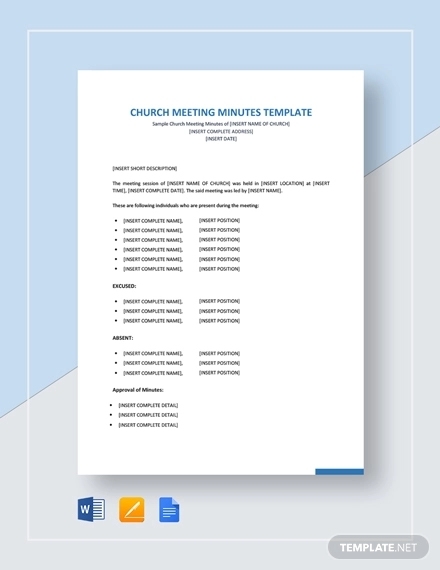 The meeting minutes that we have here in this article comes both in these sizes. You can easily print this in any printer since you can fit those size in most printers. 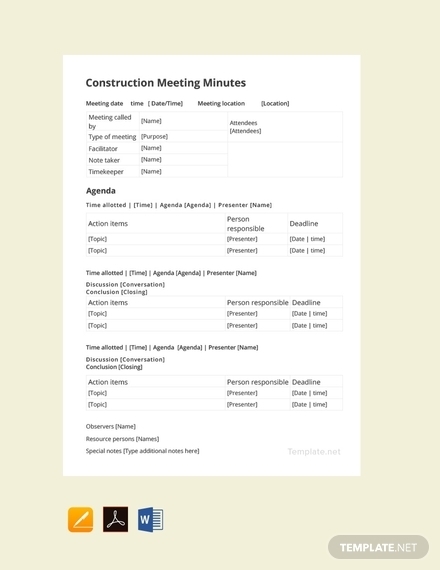 When it comes to writing minutes of the meeting, you have to ensure that every single input is correct, complete, and accurate. To help you effectively achieve this, you may have the following tips as your guide. Before the actual meeting, you have to get yourself prepared first. You must read the minutes of the previous meeting to know what the agenda is for the meeting you are about to attend. Having a meeting checklist will be handy. 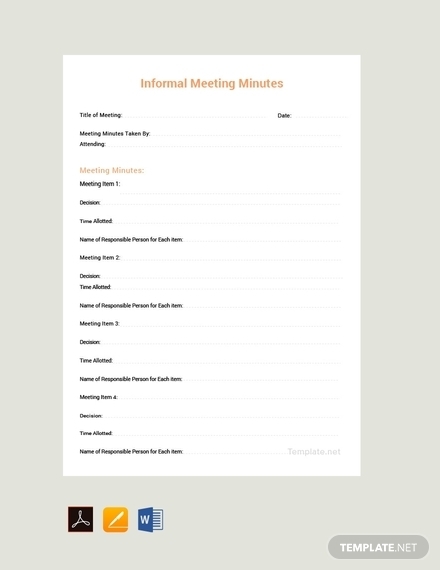 The minutes is not the entire transcript of the meeting, so you should only include the things that really matter so as not to confuse the readers (including you!) to what is of the essence. You may consider using keywords to replace certain long phrases. But do not just include whatever keyword—you have to make sure that you understand the keywords you have used so as not to confused as well. Should there be any descriptions, ensure that these are simplified and direct. Do not bother adding any other extra words and just focus on directly taking note of everything that you have observed during the meeting. In a meeting, there is a possibility that there will be other unrelated (to the main agenda) topics that will be discussed. This is why you must ensure that you that you know how to distinguish the important matters from the unimportant ones. If you find some parts of the discussions that are confusing, you have to speak up. You can freely ask the attendees for clarifications. Don’t sacrifice the details of the information just because you are afraid to speak up and clarify. 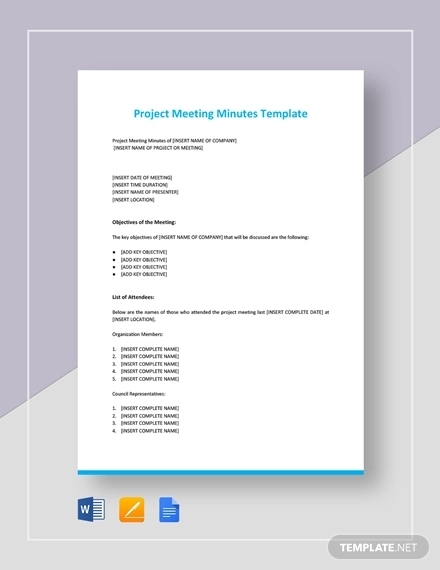 Do not worry about the paper size of a meeting minutes as there are only two sizes you should use and that is the US Letter size that comes in 8.5 × 11 inches or 216 × 279 mm and the A4 size that comes in 210 × 297 mm. The US Letter size and the A4 paper size are one of the commonly used paper sizes for various business documents. We hope that this article had been helpful for you as you prepare to write perhaps your very first meeting minutes with no worries. 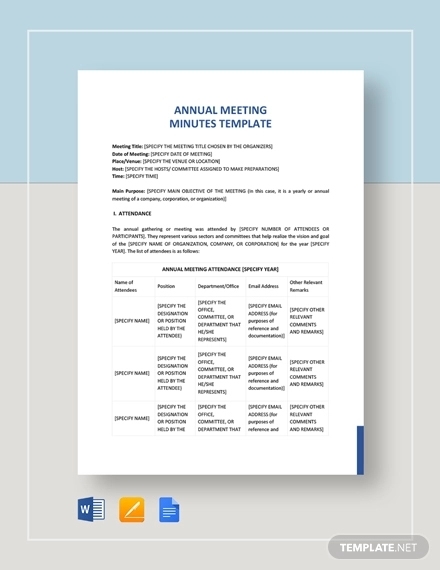 We hope that the meeting minutes templates have also been useful for you as you start creating your very own minutes of the meeting without having to worry about starting from scratch.